If you followed Beaker’s and my stories about our trip to China, you already know that we visited Beijing and Shanghai in November 2009. You also already know that it was an amazing trip with a variety of different learning experiences. China, in my point of view, has the world’s most fascinating economy. It’s growing at near double-digit rates. Despite its Communist government, China creates vast amounts of wealth, and has a mixture of capitalism and communist in their economy. Just this simple fact amazes me. China is becoming very influential in the world’s markets. So, are its consumers. For example, Chinese car market is booming. For decades the Chinese government dictated where its people could live, work and whom they could to marry. Now, all of this is left to Chinese people to figure out. The government even encourages personal vehicle ownership. Our Chinese guides told us that they will not discuss the Chinese government, Tibet and politics with American tourists. They were very honest and open to anything else we wanted to know. 1. Most of Chinese consumers are unspoiled by the easy credit. I guess it is because Chinese financial system is not geared towards consumerism and spending. The credit, even though, it does exist, is not easy to get. It is accessible mostly to higher income consumers. But not a lot of them are interested in credit. The Chinese are very cautious about their spending and stay within their means. We should realize that Chinese culture is one of the oldest cultures in the world. 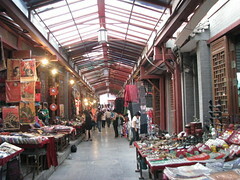 Chinese frugality is a result of the traditions and heritage. I think because of this heritage, no matter how much credit might be accessible in the future, this attitude towards spending won’t change a lot. They love saving and not spending. 2. Chinese also love budgeting. They won’t spend anything unless they budgeted for it. The typical Chinese family will make a list of things they want and need to buy and will discuss it. Together they will decide what they really need and what products are the most appealing to them price and quality wise. There are no impulse, “make me feel good” buys. 3. Our Chinese guide with the American name Joe admitted spending almost a year researching what condo he wanted to buy. He said he could spend about six months researching what computer he wanted to acquire. He admitted spending hours on the Internet comparing different products, brands, features. Also, word-of-mouth is one of the research tools Chinese use. Chinese deliberate very carefully over every purchase from food to TV, from clothes to what beauty items to buy. They take a lot of shopping trips simply for research purposes without buying anything. And they take their time. I think China is a phenomena where Communism and consumerism co-exist, and do it very well. However, Chinese consumerism is a very pragmatic type. Something that we all can learn from.